“Whatever Lola Wants” is from the smash 1955 musical Damn Yankees. 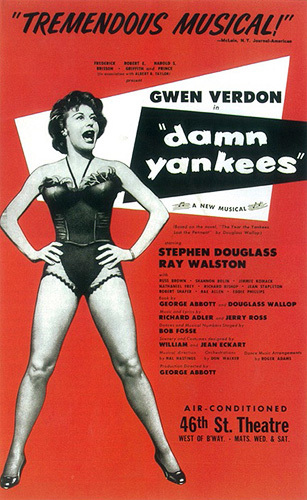 Based on the Faust legend, the musical is set in the 1950s in Washington, D.C., where, as usual, the New York Yankees dominated their division. A fan of the competing Washington Senators sells his soul to the devil for a long ball hitter that could help the Senators beat the Yankees. It starred Ray Walston and a young Gwen Verdon as Lola. The choreographer was Bob Fosse. Fosse and Verdon would later marry and work together for many years. Don’t you know you can’t win? She’s irresistible, you fool, give in! She’s irresistible, you fool, give in! Give in. Give in. “Whatever Lola Wants” was recorded on June 9, 1955 and released that year on Columbia’s All Star Pops. It was arranged by Sid Feller.